The SPF project started with an analysis of 43 heat networks in St Gallen in east Switzerland. Data provided by Energy Agency St Gallen was used to identify the most promising ones among them. “Many district heating networks get their heat from waste incineration. You can normally rule those out right away, as the cost is about 20 EUR/MWh, incineration will continue throughout summer because of no space for saisonal waste storage, and the temperature in the network is around 120 °C,” said SPF’s Igor Mojic, one of the study’s three authors. Another typical energy source besides waste is wood, for which average cost ranges between 40 and 60 CHF/MWh (35 to 70 EUR/MWh). The researchers also used the available data to estimate heat demand in summer as precisely as possible. A total of 34 networks made it to the second stage, during which SPF tried to get first-hand information by sending out questionnaires and conducting interviews over the phone. It employed Polysun 9.0 to run model simulations of 17 heat networks. The right plant size was determined by assuming a system met all the demand in summer, which led to solar fractions of 10 to 32 %, depending on the consumer base. 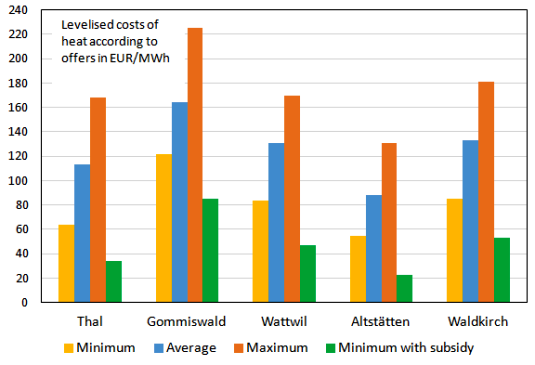 The subsequent third stage was used to perform calculations based on real-life data for five district heating networks, namely Thal, Gommiswald, Wattwil, Altstätten and Waldkirch (see the chart below). The underlying assumption was that solar collectors were roof-mounted, as “setting up PV systems on the ground is unthinkable in Switzerland. We were naturally assuming roof space to be used for installing the solar thermal system,” said Mojic. Levelised cost of heat for five selected district heating networks, as per offers by collector manufacturers. Calculations assume a 25-year economic life and a 3 % loan interest rate. The figures from the feasibility study seem encouraging, but have their limitations. "So far, calculations have been based on real-life data, but there has been no assessment on site,” said Mojic. The prices from collector manufacturers were only indicative – in reality, businesses might set them higher. “There are yet other unknowns, such as the structural limitations of the roof,” he added. The next step will be to find some district heating companies interested in integrating solar into their network. One operator has already partnered with SPF to take a closer look at the requirements, such as roof space availability. “We’re looking for other companies from across Switzerland,” said Mojic. SPF also calculated the cost of ground-mounting, which was 20 to 40 % cheaper. “So far, no one knows if and how Swiss authorities were to approve a system equipped with ground-mounted collectors and whether they would be willing to grant any subsidies. Our objective is to design an actual roof installation and apply for incentives and approval to establish a standard procedure,” explained Mojic.